Sp eaking for myself, this story would not be my first choice of Pynchon’s work to be brought to the screen. The Crying of Lot 49, in my opinion, would be so much more interesting in the hands of a great director. Perhaps that will happen someday, but with this book, Inherent Vice, so many characters are thrown out there and the convoluted nature of the story is so confusing that it just doesn’t add up to anything resembling a linear plotline. 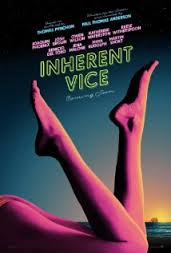 Thus, the film version of “Inherent Vice” is a thin thread filled with hidden meanings and some subtle and not-so subtle references, all of which may be easily overlooked by viewers not familiar with Thomas Pynchon’s work. But Joacquin Phoenix is wonderful as the canny and refreshingly laid-back character of Los Angeles detective Larry “Doc” Sportello. Doc is the quintessential hippie who works hard to seemingly not fit in with the majority of society’s norms. And Josh Brolin is wound wonderfully tight as the completely un-ironic caricature of a button-down cop with the chip on his shoulder and a long-standing grudge against hippies. Although I’ve always been among those who strongly feel that the medium of film is separate and apart from the printed material of the author’s original book, this film does try to follow the story Pynchon wrote in a fairly faithful manner. It’s not easy to tell if the translation was entirely successful, because some of the visual elements are the funniest parts of the film. Phoenix haplessly walking into the crowd of stuffed shirt cops and being bounced onto the pavement and later, being unsuccessfully hauled by Brolin into the back of a police car are some of the more hilarious scenes in the film. And the least effective portion was the narrated voice-over lifting some of the passages of Pynchon verbatim. It came across as a bit of an over-reach, because the characters and layers of plot should have been enough, without adding Thomas Pynchon’s written words. The bad news is this film goes long, almost two and a half hours, and could have used a good ten to fifteen minutes of editing to condense some scenes. Many of the cameos and performances by the likes of Eric Roberts, Martin Short and Benicio del Toro are brilliantly cast and spot-on, fitting in perfectly with the absurd nature of the story. The times we lived in and the social commentary on the society we have become are the best take-aways from this sometimes raunchy, sometimes funny film. It’s a must see for all Pynchon devotees, and a good fit for those of us who are “of a certain age” and feel a twinge of nostalgia for the now gone but never forgotten Age of Aquarius.